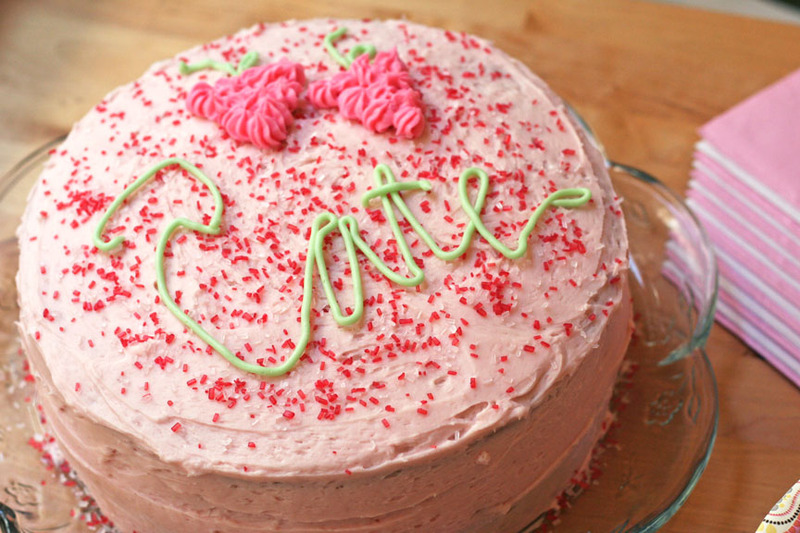 I’m sure you’re all dying to know how Cate’s strawberry birthday cake came out after my lamentations on Anna’s birthday. Success! Granted, I cheated and just did a layer cake. But I’ve screwed those up before too, so I was quite pleased when this one actually came out. Yippee! So, what did I do? It’s been a few weeks so let’s see if I can remember. Used cake strips when baking. Froze the cake before icing. Iced the sides first…focusing on the gap between the cakes first, then working up and down from there. For both the sides and the top I did a thin layer first and didn’t worry about crumbs, then did another layer on top that actually looked nice. I don’t have a cool frosting-spreader-spatula-thingy, so I used a regular old butter knife and used the edge of a cereal bowl to scrape off excess and/or gunky frosting as I went along. I’m a painter, not a sculptor…so doing a layer cake and then writing/drawing on top is more comfortable for me. However…I will try doing a shaped cake again another year. Especially after the helpful comments on my last cake post. And, if you want some really great decorating tips, make sure to read Becky’s comment (it’s #13 on my other cake post). She is a Wilton cake decorating instructor and makes cakes for a living…so she had some really fantastic tips. One more thing…the moms at the party were asking for my recipe. It’s an old family secret that I just can’t share. Yeah right. Filling: Jello Vanilla Instant Pudding mix (follow directions on package) with sliced strawberries laid on top of the pudding layer. Frosting: 1 C butter, 1 tsp vanilla, 4 1/2 C powdered sugar, 3-4 Tbsp Milk. Beat butter (at room temp) and vanilla on medium speed for 30 sec. Slowly add half of sugar. Add 2 T of the milk. Beat in remaining sugar and enough milk to desired consistency. I kind of want to go make a cake now. Thank you for the cake strip tip!! That cake looks absolutely delicious!! Now I’ve got to start thinking about Penelope’s first. . . 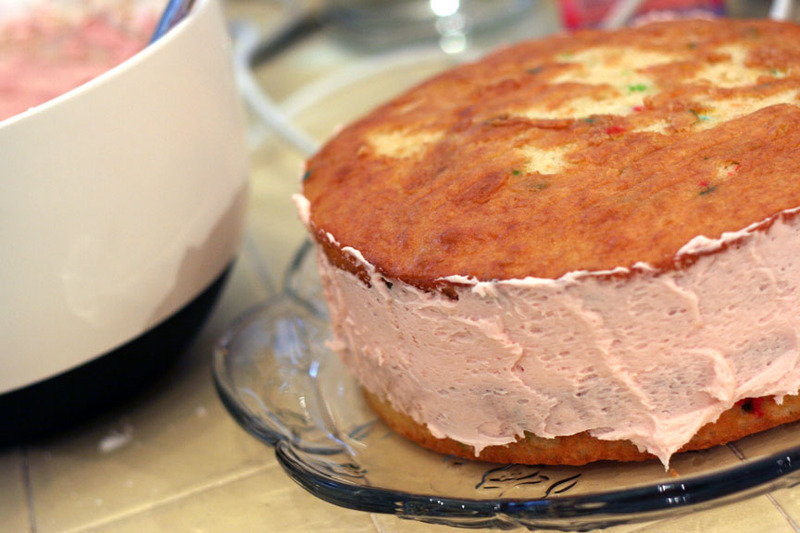 Thanks for sharing some really great cake advice… I can never seem to make a cake without botching something importatnt in the decorating and I don’t go for glamorous… I just want to frost it without getting cake crumbs all over the place! Definately going to try this technique with my daughters birthday next month! That looks beautiful! I am so happy to have found your blog. I just started a dinner menu blog myself after not finding any (obviously, I’m not a good seacher or I would have found yours 🙂 And I was excited for the Utes, too. They played SO well and made our conference look good. Yay. I’ll be back often! Not cake related, but CONGRATS!!! on having your svmomblog post selected for publication! You are one amazing woman!